On Saturday February 25th the brilliant theatre performance of "Oh Mary" will show at St. Just Town Hall. We saw this show last winter and it was superb. "This true story is a swashbuckling tale of transportation, love, escape, tragedy and redemption that spanned the world between Cornwall and Australia". "Oh Mary" is a one-woman show performed by Bec Appletree. Tickets are £6 in advance (ask in Bygones Antiques or call 01736 788088) or £7 on the door. Proceeds from the bar will go to Bosavern Community Farm. 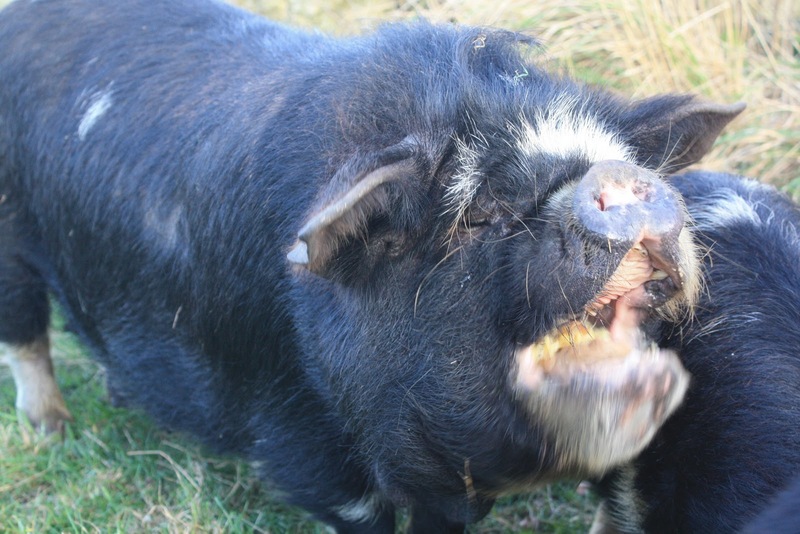 The photo for the cover of Pendeen Outreach newsletter was taken by Jackie Packer, who has also supplied this adorable photo. On the last Saturday of every month there is a table-top sale held in the Centre of Pendeen on Pendeen village main street, raising funds for various charities and local concerns. 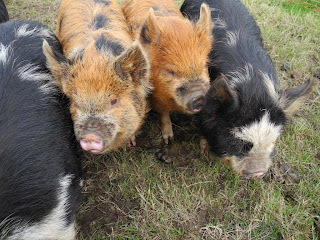 Bosavern Community Farm always has a stall there thanks to the generosity of our volunteers and supporters, and this coming Saturday 28th January is no exception. The sale runs from 10:30am till 1:30pm. 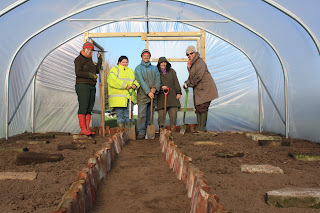 Finishing beds in the new polytunnel. At last this task is complete! 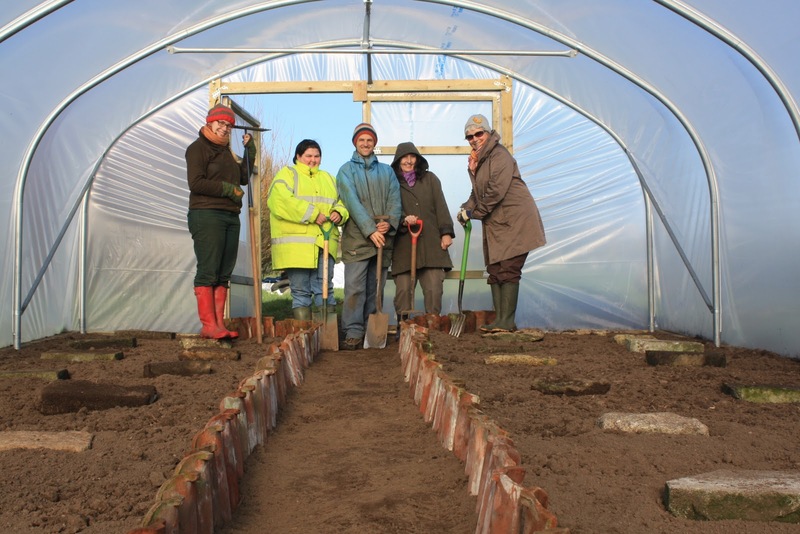 We put the plastic skin on our new polytunnel back on the first of November, and started digging the beds that same day, but because of the amount of couch grass roots in the ground, and all the other jobs that have needed doing, we only finished the beds today. But it's a job well done, and we are very grateful for all the hard work put in by volunteers too numerous to mention - a big thankyou to all. We have dug the whole tunnel twice, redistributed soil to make a level growing surface, lined the beds with reclaimed roof tiles, put stepping stones on the beds to allow access, planted up half the tunnel (green sprouting broccoli, kohl rabi, spring cabbage, and winter lettuce), and applied our own compost to one quarter of it. Now we will install an irrigation system ("soaker hose" made from recycled rubber car tyres), and use the remaining beds to grow leek and cabbage seedlings for transplanting outside in the spring. Today's team having completed the task - Bex, Anne, Hugh, Willow and Sonja. 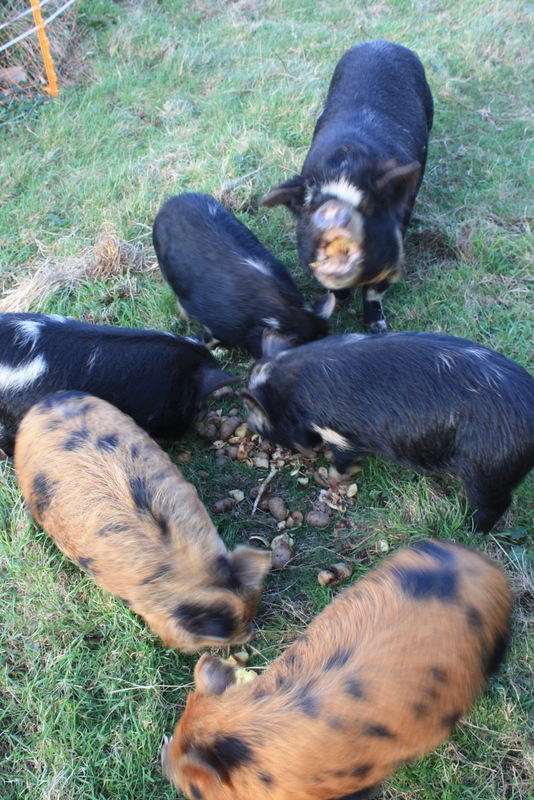 Ebony and her piglets eating boiled potatoes. 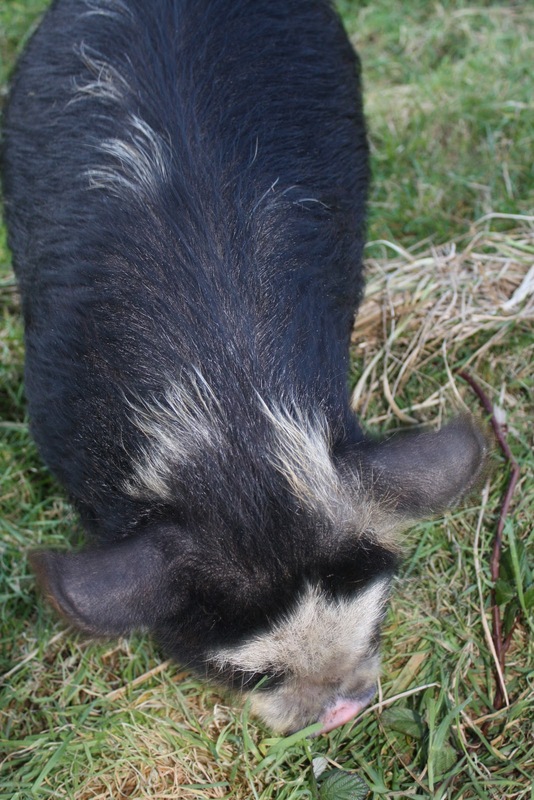 Ebony is the mother of five piglets - Blue, Ginger, Horus, Lowenna and Popo - the whole family of whom now live at Bosavern Community Farm. 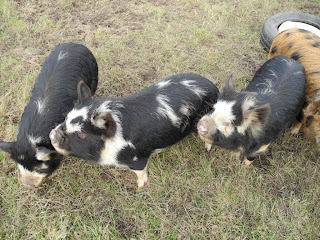 They are kune-kune pigs, a small hardy breed native to New Zealand and the Polynesian islands. Although popular as pets they serve as useful grazing animals for the farm, helping to keep grass and plant growth down whilst manuring the land as they go, and will in time make good sausages and meat the same as our last pigs (Penny, Sage and Onion). 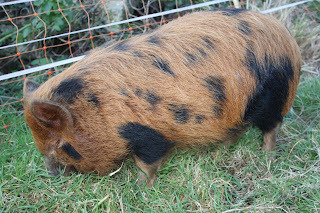 Ebony and the gang came from an organic farm just north of Penzance, and are very friendly. They love eating boiled potatoes, which is very handy because we have a lot of reject potatoes from our vegetable field. 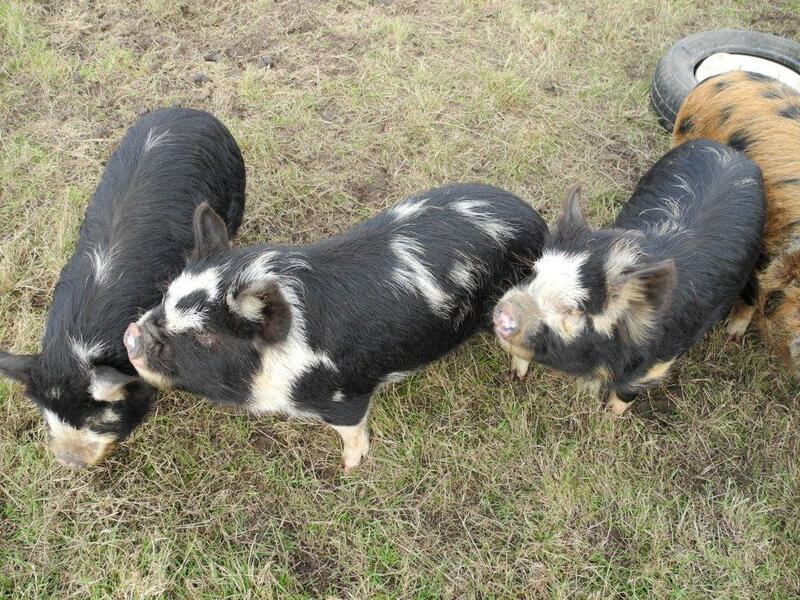 They also eat organic "sow and weaner nuts", which cost twice as much to buy as non-organic feeds. 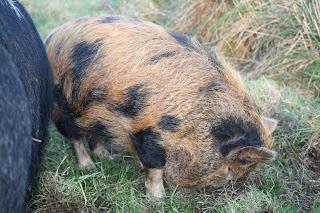 Ebony eating like a pig. Our new kune-kune (more about them later!) 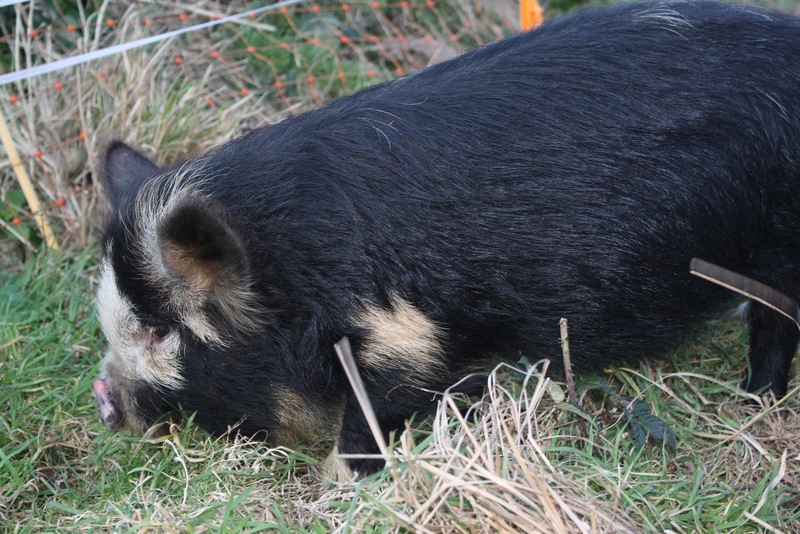 pigs adourn the cover of February's edition of the Pendeen Outreach magazine. 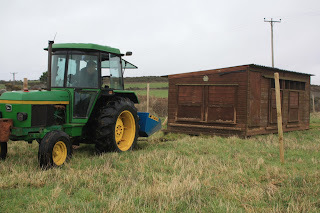 On Thursday 12th January the Mayor of St. Just brought his tractor down to the farm and helped us move the chicken sheds onto new pasture. 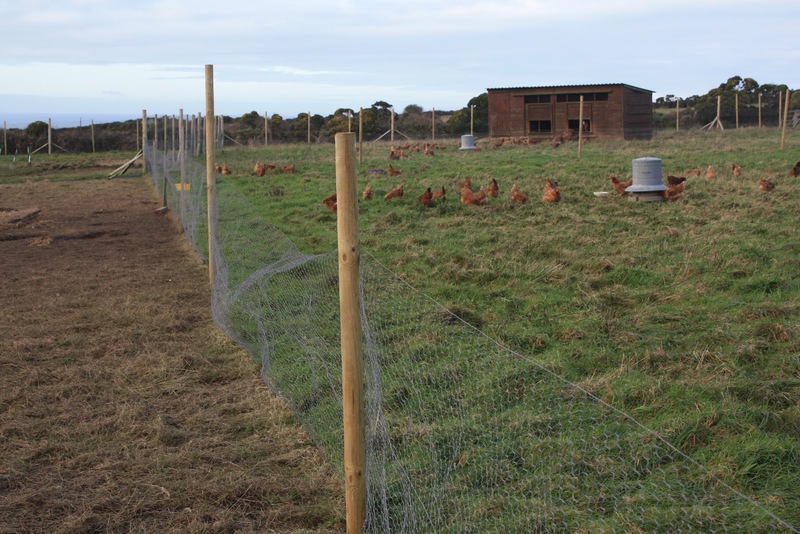 Our chicken field measures 2.26 acres, and is evenly divided into six sections, each being fenced off to create a separate chicken run or paddock. Our plan is to rotate the birds every six months to give them fresh pasture and allow the old pasture time to recover. 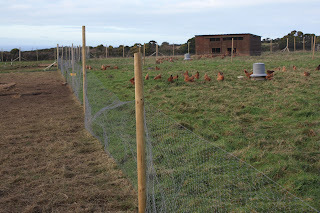 Whilst our first flock of 40 chickens had been happily living on their run for over one year without it looking degraded, the other two flocks each of 80 chickens had worn their grass down to bare earth and certainly needed moving on. Before moving them we wormed and de-loused them. Towing a shed from one pasture to the next. Each shed is large enough to house 100 birds under organic conditions, and each run is also measured accordingly. The sheds are mounted on skids, like a sledge, so they can be dragged by tractor without the need for lifting or for wheels. They weigh a ton (or more!) but the tractor just about managed. Lucky girls leaping out into fresh green grass. 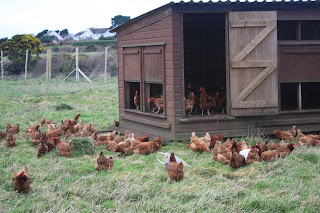 We have been lucky this winter, and our 200 chickens have between them kept supplying the farm with at least 5 dozen eggs a day for us to sell at the gate, Pendeen Farmer's Market, and in our weekly veg-boxes. 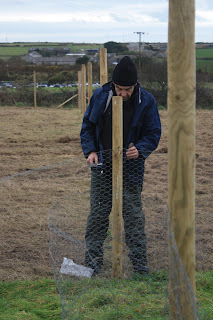 Re-installing the internal fencing between flocks. Having taken down some of the internal fencing to allow the sheds to be dragged between runs, afterwards we had to put it all back together again. This job was only completed today, when small wheelbarrow-size gates were installed in the fences between internal runs, making collecting eggs and cleaning out the sheds a much easier job (even if only one person were to do it). We also put skirts of wire-netting around the bases of each shed to prevent the chickens from excavating under the houses to lay their eggs out of our reach. Spot the difference between old pasture and new. Many thanks to Morley, Deb, Sonja, Jenny, Anne and Jim for helping. 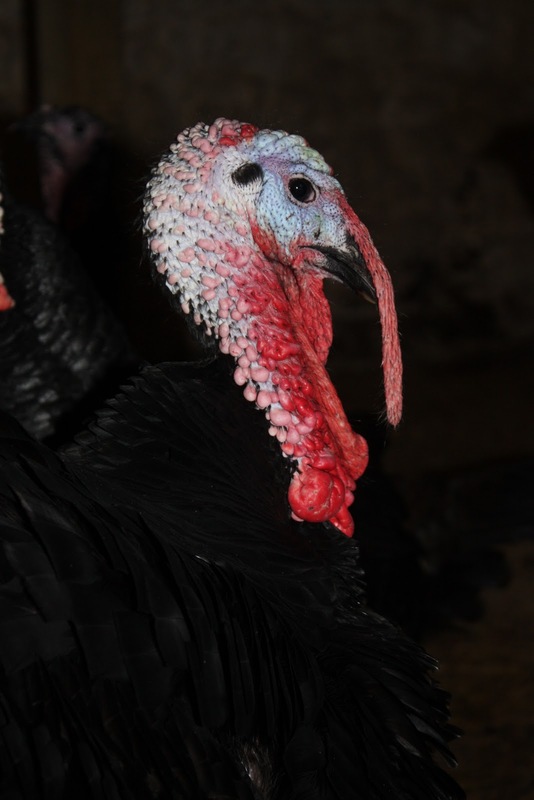 The time for celebrating the festive season by eating turkey is now past, and our turkeys were slaughtered one month ago now, but we thought we'd celebrate their brief lives with some photos and anecdotes. When our turkeys got older and more flighty, three of them took to roosting for the night in the rafters of the old forge, even though they seemed scared of the return to earth come morning. 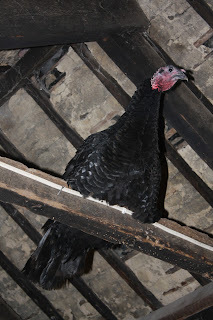 The other 18 birds roosted on the internal walls and window-sills of the old forge, hardly any of them using the purpose-built roosts we'd constructed specially. 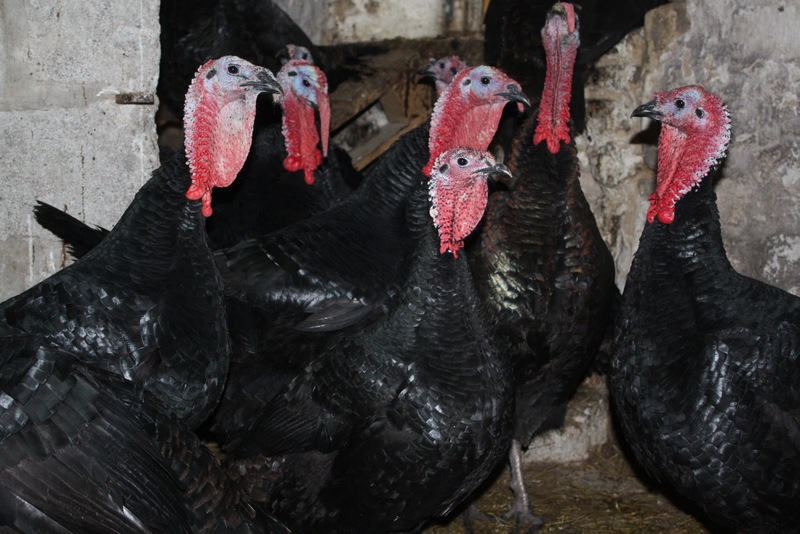 Our flock of turkeys free-ranging in their outside pen. Before long they'd started flying out of the pen, only to hang around on the outside wondering why they weren't still inside it. Very few of them managed to fly back into the pen, so they usually needed catching and putting back inside manually. Sometimes when a gang of them got out they'd wander into the farmyard to see what we were up to, and used to love the nasturtiums growing in the old cattle trough. Portrait of a male turkey just before slaughter. 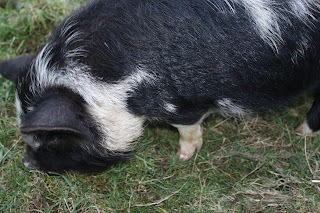 The breed was Norfolk Black, and they looked stunning, especially with winter sunshine shimmering on their feathers. When the males fought they'd grab hold of those red bobbles using their beaks, and wrestle, and you could hear the bobble snapping back into place once it had been wrestled free. A clutch of turkeys hanging out inside the old forge on a rainy December day. Everybody who ate some of the turkey for Christmas said how good they were, someone even saying it was the best turkey they'd ever had. So all that effort was worthwhile then, and we even made some money on the venture.